Oxford, CT (May 26, 2015) – Morse Watchmans’ new SmartKey Reader, recently introduced at ISC West, is saving users time and convenience by eliminating the need to add, update or remove keys at the cabinet. Now, users can simply insert a SmartKey into the SmartKey Reader to add new keys to the system, delete keys, or identify existing keys – all from a single location, making it even more convenient to manage keys. 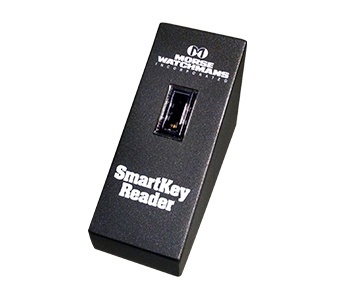 Designed for use with the KeyWatcher® Touch system and accompanying TrueTouch software, the free standing SmartKey Reader connects to a computer via the USB port. Its easy-to-use interface in the TrueTouch software is specifically designed so that users can add or delete keys quickly and efficiently. In addition to the KeyWatcher Touch system, the reader is also compatible with the KeyBank Touch Auto v1.7, available in Spring 2015. With this version of KeyBank Touch Auto, users can enter vehicle information including year, make, model, sub-model, color and fuel type when adding a key, in addition to the delete and identify functions.